Class Supplies: Laptop with Pro-Stitcher Simulator loaded (if you have any issues, come early and we will help you!) or Pro-Stitcher tablet with the keyboard and a wired mouse. At age five, Susan's mother taught her to thread a needle and make a running stitch. Before long, she had taken over the sewing machine. Growing up, Susan's interests included textiles, drawing, design, and a broad range of arts and crafts. While raising three busy children and running an insurance business with her husband, her hobbies expanded to include digital drawing, web authoring, and computer technology. Yearning for a career using her creative talents, Susan was smitten after discovering the combination of her creative joys in one activity - long arm quilting! Fabric, drawing, design, and sewing all in one complete package was simply too enticing to resist, and soon she was happily partnered with her HQ Fusion and HQ Pro-Stitcher. 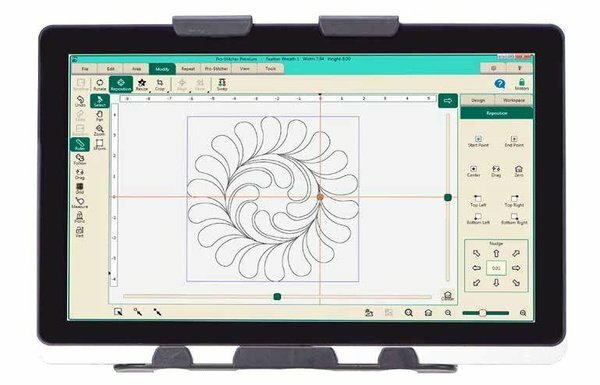 Mastering Pro-Stitcher and Art and Stitch, and seeking innovative ways to use both, Susan now enjoys quilting professionally with the HQ Infinity. Includes Lunch and two days of hands-on training.